CD review: "One Endless Night"
This review first appeared in the July 3, 2000 edition of the American Reporter. Like his friend Tish Hinojosa, Jimmie Dale Gilmore has hewed his own path through the musical world. Sometimes straddling, often defying, Gilmore simply doesn't recognize the artificial boundaries the music industry comes up with the try to shape our buying habits. Like Woody Guthrie, Gilmore is impossible to pigeonhole. His politics make country music types squirm, but his music is so deep in the heart of what it means to be American that it cheapens his music to dismiss him as only a folk musician. Possessed of one of the most distinctive voices in the history of recorded music, Gilmore is more a stylist than singer-songwriter. 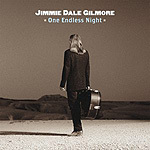 On his latest release, "One Endless Night," Gilmore only penned two songs. And while his "One Endless Night" and the Mexican-tinged "Blue Shadows" may be the best songs on the album, it is his personalized readings of songs by folks like Butch Hancock, Jesse Winchester, John Hiatt, Townes van Zandt, Jerry Garcia and Walter Hyatt that may stick in your head the longest. As always, Gilmore surrounds himself with top-notch talent. Buddy Miller sits in on guitar, Tammy Rogers on fiddle, and big-name singers like Emmylou Harris, Jim Lauderdale and Julie Miller on backup vocals. And perhaps to remind us anew that he'll not be stuck in anyone's category, Gilmore closes out the album with one of the most memorable versions of "Mack the Knife" you'll ever hear.